Udupi, 14 Sep 2016: Neil Armstrong, American astronaut after becoming the first person to land on the moon in 1969 said, "That’s one small step for man, one giant leap for mankind”. Another great personality, APJ Abdul Kalam, the former President of India had said, “You have to dream before your dreams can come true”. These two quotes by two great personalities seem to have been the guiding stars in the life of Alphons D’Souza of Moodubelle-Kattingeri whose small steps on the drama stage enabled him to take a giant leap into the world of Konkani cinema. His dream as a young college student in Mangalore to see his banner in future on the facade of Prabhat Cinema, Mangalore has come true as the banner of his maiden Konkani film, “Ek Aslyar Ek Na” has been prominently displayed in front of the cinema hall since the last two weeks as the movie is being run in that cinema to full capacity. This is the story of Alphons D’Souza whose amazing journey from a stage artist to film actor is quite interesting and inspiring. Born on 28 July 1973 as the third child among five children, four sons-Ronald, Raphael, Alphons, Valerian and one daughter-Celine of late Ligory and Piad D’Souza of Moodubelle-Kattingeri, Alphons had his higher primary and high school education in St. Lawrence Educational Institutions. He continued his Pre University Course in Pompeii Junior College, Aikala and graduated with BA degree in Economics from St. Philomena’s College, Mysore. Having realized the value of specialized education in a competitive world and to have better prospects of employment, Alphons was not satisfied with mere graduation and joined SDM College, Mangalore for Business Management course which he completed in 1997. While in high school, Alphons had developed an interest in cricket and volleyball, cricket being his first love in which he excelled as an all-rounder and used to participate in a number of tournaments. However, it was the stage performances that created confidence in Alphons and realised that he had the hidden talent for natural acting. While in high school and junior college, Alphons used to be part of plays on the occasion of school or college days as well as talent days. While he was a student of Business Management in SDM College, Mangalore, Alphons acted in an English language play titled “They, Them and Us” that brought forth his acting talent from where he never looked back. Like many youngsters, right from the college days Alphons was attracted to the world of cinema and idolized film stars such as Rajesh Khanna and Amitabh Bachchan. He used to get hold of ‘Chitralok’, the movie supplement of Udayavani and dream of his picture being displayed in the columns of the paper. Similarly, while passing through Prabhat Cinema, looking at the huge banners of the movies and stars he dreamt of seeing one of his own pictures on the banner in the future. Having successfully completed the Business Management course, Alphons moved to Mumbai in search of employment and worked for one year in the BPL Company before moving to Dubai, the land of better prospects and adventure. After serving in two companies one after another, Alphons decided to carry on his own venture and did freelance advertising for few years and in 2011 acquired license for his own advertising company named “Allprints Advertising”. While in Dubai, Alphons was waiting for an opportunity to showcase and improve his talent of acting. He got such an opportunity when Bellevision (UAE), comprising of Belleans in Dubai was organized under the leadership of Elias D’Souza, Ronald Sabi D’Souza, Ronald D’Souza-brother of Alphons and others. For the inaugural function of Bellevision (UAE) in 2001, Alphons had an opportunity to act in “Badyachi Bayl” written by CGS, Taccode in which he excelled in the lead role. CGS Taccode who had attended the function greatly appreciated the way the play was presented and congratulated Alphons for his excellent performancce. Bellevision (UAE) provided a base for promoting the acting talent of Alphons who used to act in various skits presented at annual functions. As the fame of Alphons as an versatile actor spread across, other organizations such as Udyavarites, Karavali Milan, Daiji Dubai invited him to be part of their entertainment programmes. 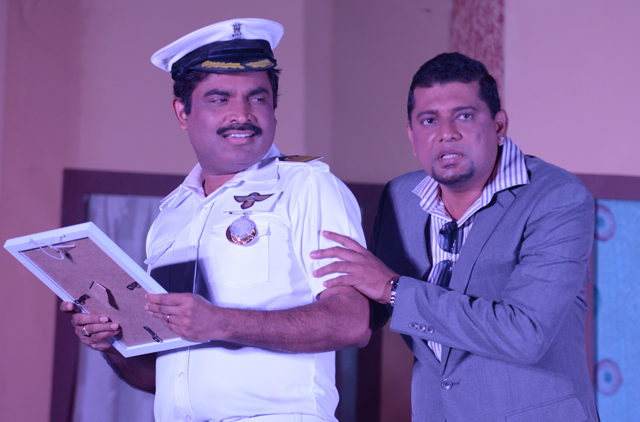 He acted in four skits during the Hnery D’Souza Nite conducted in Al Nasr Leisureland, Dubai. 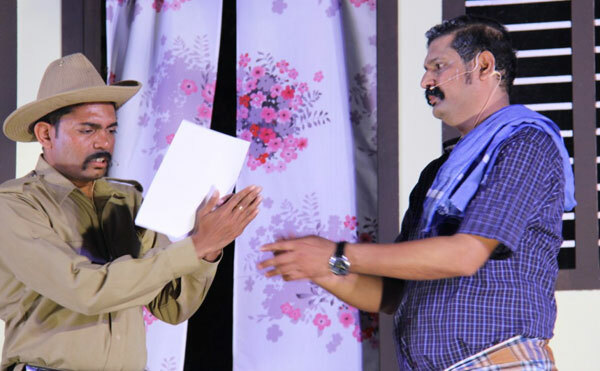 In a variety entertainment competition held by the Mangalore Konkans, Dubai, Alphons won the first prize for his comic role of a police inspector in a skits titled “Chai” directed by Dayan D’Souza of Mukamar. Alphons’ foray in negative roles began with “Matlabi Sansar’ written and directed by Francis Fernandes Cassia. 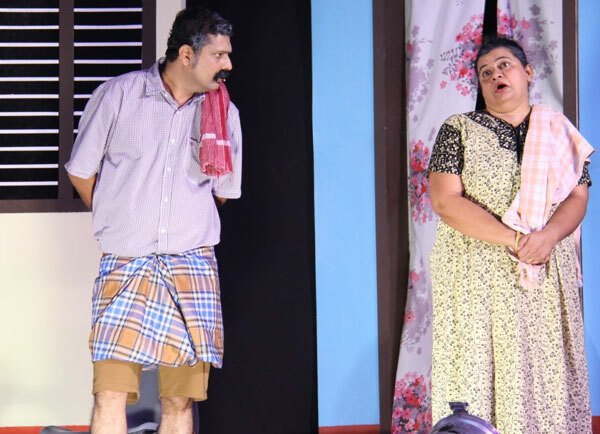 From this play, Alphons graduated as an effective and forceful actor in negative roles culminating in such a role in the film “Ek Aslyar Ek Na”. 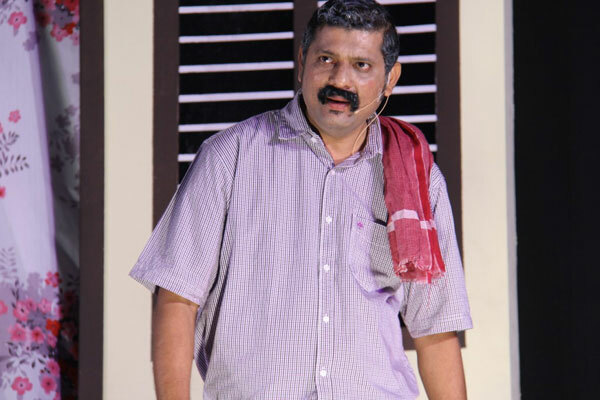 While he has been quite comfortable in comic roles, his acting in negative role of Sunil Kumar in “Ami Nathully Vellar”, a play translated from original Marathi written by Ramanand Churiya to Kannada and then in Konkani by Richard Moras, Alphons manifested his calibre as an actor to reckon with in negative role. The play based on the famous Nanavati case was gripping and full of drama. 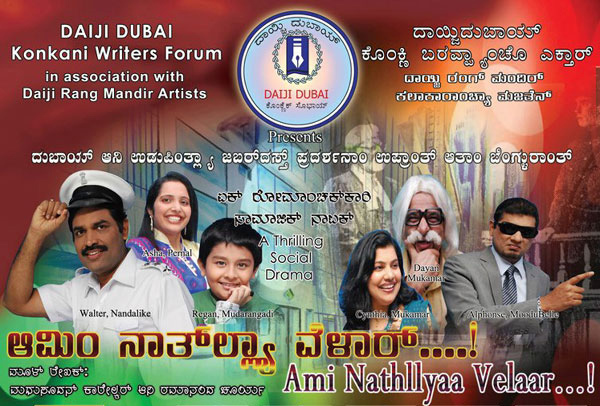 The play had eight successful performances in Dubai, Abhudabi, Qatar, Kuwait, Mumbai, Bangalore and Udupi. 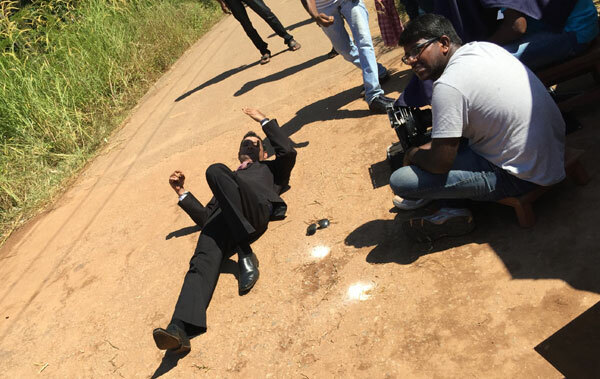 The major breakthrough for Alphons in exhibiting his acting talent came in 2014 with “Bale Telipale” competition that was organized in Dubai by Namma TV in which twelve teams vied with each other for the top position. 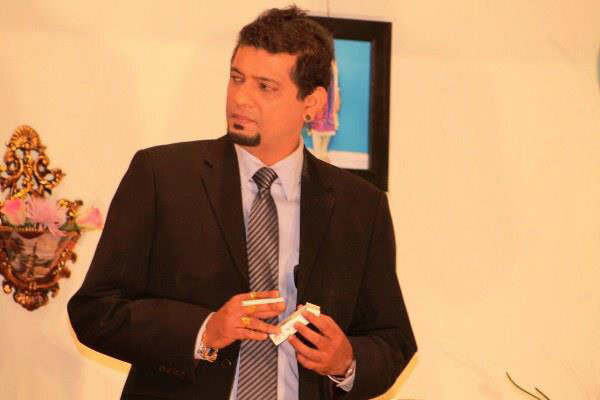 At the end of the competition, the episode directed by Pradeep Barboza, Palladka in which Alphons acted along with other three and presented by the Tamasha Friends Dubai team secured the first place. 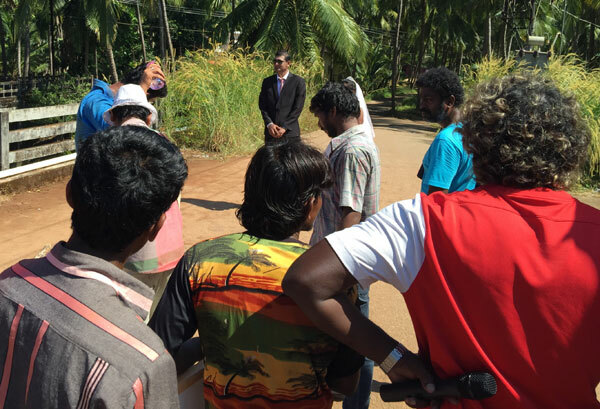 After the success in “Bale Telipale” competition, Pradeeep Barboza, who had already made a name in Dubai by his popular plays, thought of producing a film. He wrote the screenplay keeping in mind Alphons for the negative role. 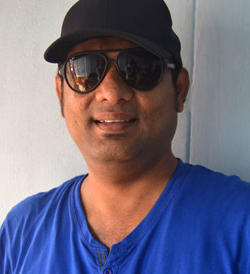 Alphons was associated with the production of the movie right from its planning through the entire shooting and post production. The entire movie was filmed in a month from October 2015 and has already being screened in Dubai and other places. 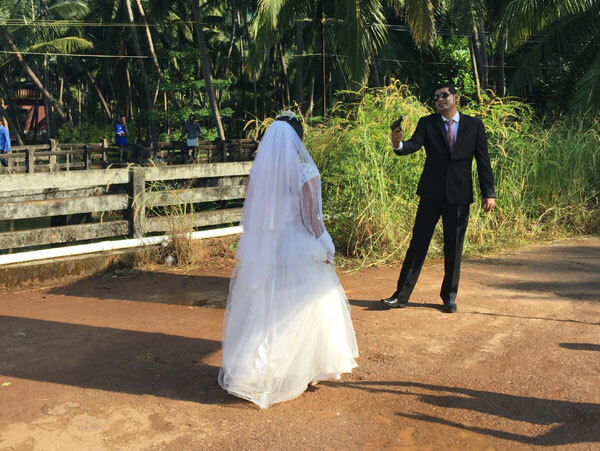 “Ek Aslyar Ek Naa”, is the Konkani film produced by Frank Fernandes of Thottam, a prominent entrepreneur in Dubai, written and directed by Pradeep Barboza who has also acted in the lead role. Alphons in the negative role as Johnny has put in his best performance so far and has been viewed as an effective and natural actor. 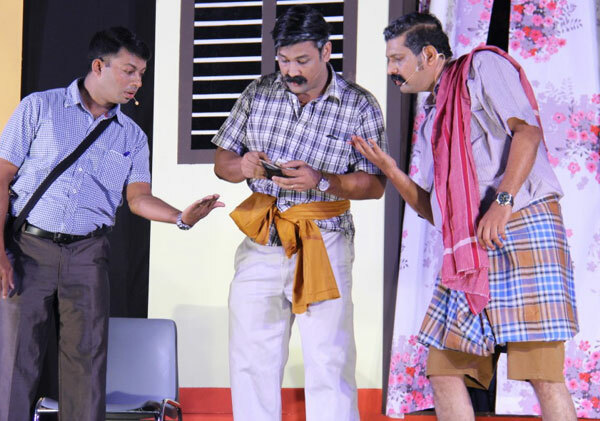 Soon after the shooting of the film was over, Pradeep Barboza who had already written another play “Sovai Budhvont” flew back to Dubai along with Alphons and presented the play in the premises of St. Mary’s Church, Dubai for charity which was viewed by nearly 2000 spectators. Alphons in the comic role of Alfiyab was superb in this play as well. “Ek Aslyar Ek Na” was premiered on 20 May 2016 at Novo Cinema Galleria, Hyatt Regency, Dubai with four shows. Thereafter it was shown at Abhudabi, Kuwait, Qatar, Sharjha and Israel. Realizing the popularity of the film, the team made arrangements to screen “Ek Aslyar Ek Na” in Mangalore and was premiered at the Prabhat Cinema two weeks ago which was inaugurated by the Bishop of Mangalore, Most Rev. 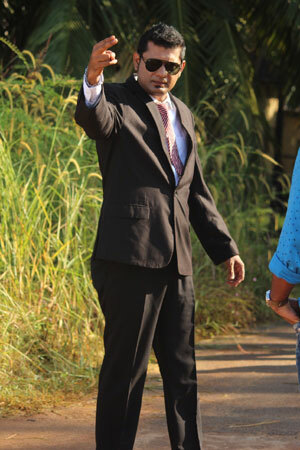 Dr. Aloysius P. D’Souza. A huge cutout of the film with the picture of Alphons along with the main characters has been displayed in front of the cinema hall, thus fulfilling the long standing dream of Alphons to see his own picture on the banner in front of the Prabhat Cinema. 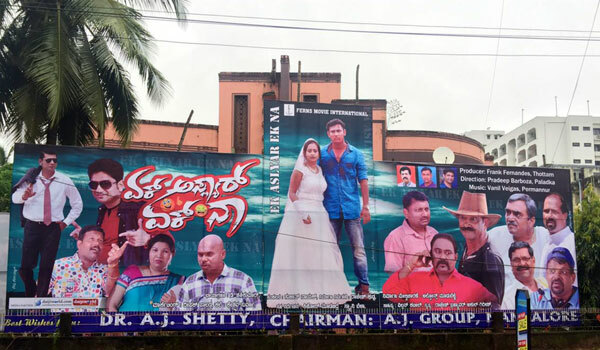 The film is also exhibited in Big Cinema in Mangalore, Amarashree in Moodbidri and Planet in Karkala. The Konkani speaking people in Udupi will have an opportunity to see “Ek Aslyar Ek Na’ from Friday, 16 September 2016 at Ashirwad Cinema at Santekatte, Kallianpur and at Inox in Manipal. Next it will be exhibited at Nakshatra Cinema at BC Road, Bantwal. The future plan for the screening of “Ek Aslyar Ek Na” in India include Bangalore, Mysore, Pune, Mumbai, Indore, Baroda and Delhi. The foreign locations include New Jersey in US, England, Canada and Australia. With the success of their maiden venture “Ek Aslyar Ek Na”, there is a plan for another project which is likely to begin in December 2016. Alphons is married to Reshma Blescilla Martis from Moodubelle and they have two children, Aubin Rawlins and Alicia Roxanne. 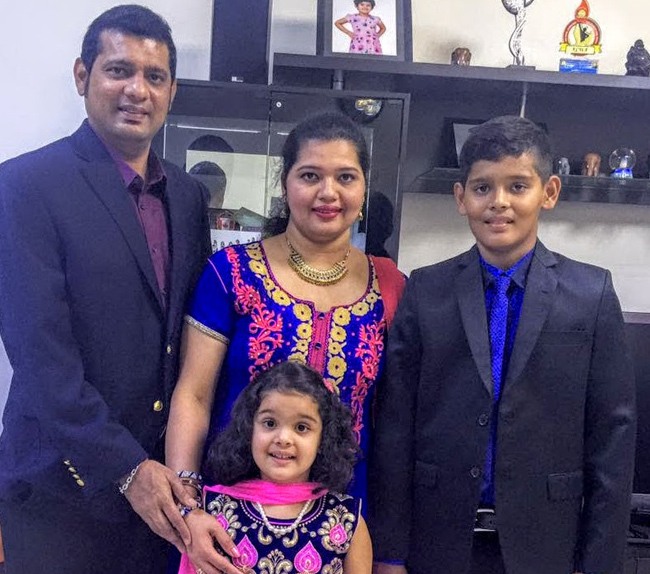 Alphons D’Souza recently has been setled in Canada with his family. Hearty Congrats to you. God Bless you. Congratulations dear Alphonse, we are proud of you. Wishing you all the very best in your future endeavors. Wishing you all success and good luck for your future projects, You are inspiration for the next generation - You have done all of us proud. Enjoyed your acting . Very matured and total personification of the Role. Happy to read about you. Wish you all the very best in your acting career. You have all that a cinema actor needs. Congratulations. Proud of AJ Alphs! Wonderful and talented actor. Also a fine human being. Congratulations Alphonse and all the best for all your future endeavors. Way to go! Hearty congratulations Alphonse, Indeed itâ€™s a great achievements. God has rewarded your hard work and determination to success. You have definitely made us and all loved once/ society proud indeed. Dr.Eugene,thank you so much for the beautiful write up. 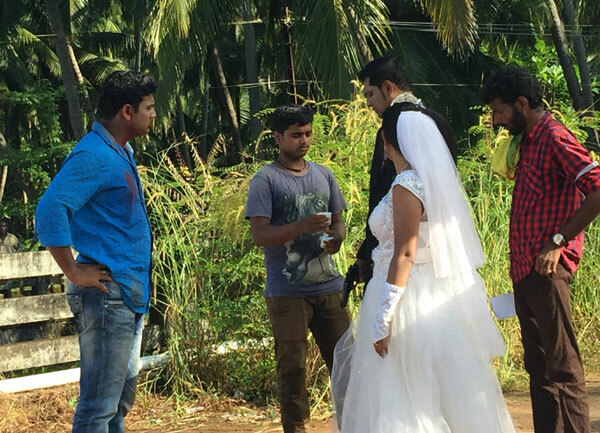 I am super thrilled to read the acting talents of our own actor next door - Moodubelle. The kind of challenging role is what he has to keep playing to make the world sees his true talent. Bravo Alphons D souza, proud of you. Congratulations dear Alphie on your great success. It is very nice to see from a small stage actor has now become a supper star. I saw the movie EAEN and must say your acting as Villain is supper. The movie itself is supper and I recommend all to watch it. Prod of your achievements. All the best for the future. Alphonse is having bright future in movies, his personality, voice modulation, body language all suits for perfect actor, wish our Alphy should get not only coastal wood movies, he should get the opportunities in sandalwood, Bollywood and Hollywood movies too, let our Alphy shine everywhere, my good wishes and prayers are with you. 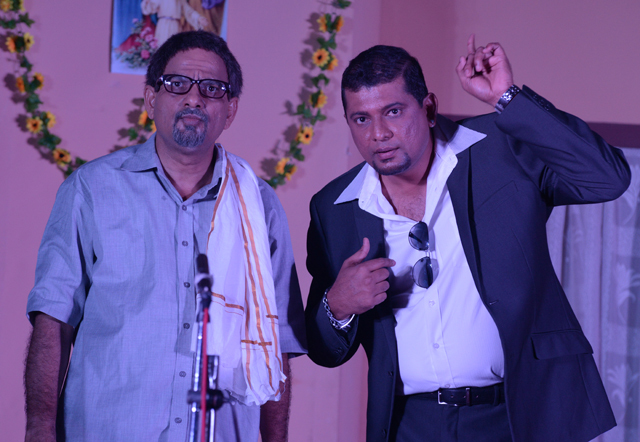 Finest actor in Konkani, Tulu and possibly Kannada, Hindi in the near future. 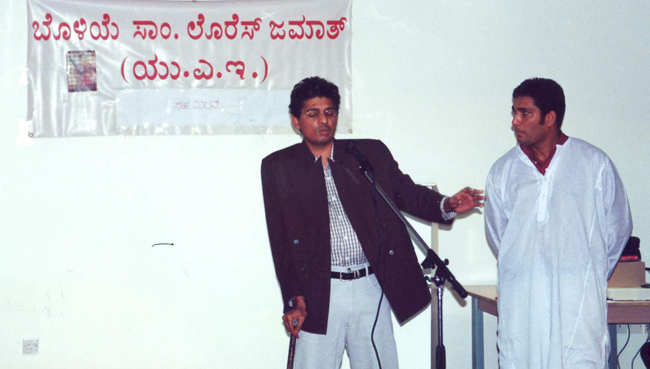 One of his first plays in Dubai where he acted and directed a drama for Kanajarians. If at all, I have to watch a repeat show of Ek Aslyar Ek Naa it would be only for Alphonce and his brilliant acting. He has grown as an actor. Congrats Alphie and wishing you success in future endeavors. We all are proud of you Alphons.Wish you all the best and success in the new venture.